BECAUSE of a major systems failure there was no internet access around Melbourne Park for more than four hours yesterday. Officials here at the Australian Open had to stay in touch via walkie-talkies, umpires had to record scores by putting pen to paper rather than typing into hand-held devices, photographers were unable to send their pictures around the world and reporters had to rediscover the fact that reference books can be as good a research tool as Google. The link with cyberspace was repaired in mid-afternoon but, by the end of the day, Australia was once again remembering how things used to be. Lleyton Hewitt seems to spend more time these days on the physiotherapist's couch than he does on the tennis court, but once again the former Wimbledon champion is the host nation's last singles representative here. Not that the world No 181 is expected to be around much longer: his fourth-round opponent today, Novak Djokovic, the current No 1 and defending champion, has dropped just 10 games in his first three matches. For all his gritty determination - epitomised by his third-round victory on Saturday over the world No 25, Milos Raonic - and his admirable cussedness at refusing to give in to the injuries that have plagued his latter years, 30-year-old Hewitt is yesterday's man. Tomorrow waits at the feet of Bernard Tomic, a 19-year-old from Queensland whose exploits have dominated the first week of this tournament. Tomic's run was ended last night by his boyhood hero, Roger Federer, who gave the apprentice a master class, winning 6-4, 6-2, 6-2. Tomic had taken a set off the world No 3 when they met on grass in the Davis Cup in Sydney last year but he never threatened to do as much on this occasion. Once Federer broke in the ninth game of the first set, the match became one-sided. Knowing Federer would punish the slices and spins that had flummoxed some of his earlier opponents, Tomic upped the pace but the 30-year-old Swiss had an answer to almost everything. Federer kept pulling Tomic around the court, exposing the teenager's movement as his greatest weakness. 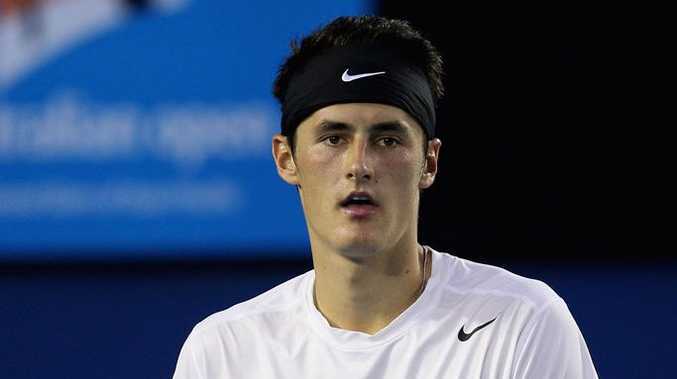 There were several occasions when Tomic looked over to his entourage with an expression on his face that suggested he did not know what to try next. "It's very good experience to play a player like that," Tomic said. "I don't think there will ever be as good a player as him. I think you can only learn what he does and take in what you learned. Last time I learned a lot of things when I played him, and this time I learned even more. For me, it's a great pleasure and honour to play him. I think you learn a lot over the period when you play these top three or four guys." He added: "I think the top four guys are at a different level. From five, six on they're all beatable, but the top four guys have something special. That's why they've won Slams, and that's why [Andy] Murray plays so consistent." Tomic, who has never been short of confidence, believes he will have closed the gap on the world's top four within 18 months, provided he can continue to improve physically. At 6ft 5in and more than 14st he has a fine physique for the modern game, but the world No 38 needs to work on his strength and stamina. With very few ranking points to defend between now and the summer, he should improve his ranking sufficiently to be seeded at the French Open and Wimbledon. "Having played all the top four guys now and Roger twice, I think there is a lot for me in the future," Tomic said. "I'm always going to get better and better. Looking back a year, I was not as good as now. And now, looking [forward] to next year, I'll probably be even better. That's a scary part for me because I know I can improve a lot." Federer said Tomic had had "a wonderful tournament" and added: "Now it's about keeping that up time and time again, day in, day out, when maybe he's not only playing on centre court, but also on the smaller courts. You have to go through those times as well." Victory in his 999th singles match as a senior professional took Federer to his 31st Grand Slam quarter-final in succession, a remarkable statistic when you consider that only five other players (Feliciano Lopez, David Ferrer, Fernando Verdasco, Tomas Berdych and Albert Montanes) have played in each of the last 31 Grand Slam tournaments. If he wins the title here, Federer will pass Jimmy Connors' all-time record of 233 victories in Grand Slam tournaments, but he next faces a major test in the quarter-finals, where he is scheduled to meet Juan Martin del Potro. The Argentine is rediscovering his best form after a year out of the game with a wrist injury, which he suffered shortly after beating Federer in the 2009 US Open final. The winner will play either Rafael Nadal or Tomas Berdych. Nadal, who has yet to drop a set, beat Lopez 6-4, 6-4, 6-2, while Berdych overcame Nicolas Almagro 4-6, 7-6, 7-6, 7-6 in what became an ill-tempered match. Berdych was unhappy when Almagro smashed a ball straight at him. The Spaniard apologised but Berdych refused to shake his hand at the end of the match and was booed by the crowd. The quarter-finalists in the top half of the draw will be known by the end of today. Djokovic or Hewitt will play Richard Gasquet or David Ferrer, while Murray or Mikhail Kukushkin, who were due to meet in the small hours of this morning, will meet Jo-Wilfried Tsonga or Kei Nishikori. British interest in the men's doubles ended when Colin Fleming and Ross Hutchins were beaten 6-4, 0-6, 6-2 by Mike and Bob Bryan. The American twins said afterward that they expected the rapidly improving British pair to qualify for this year's Barclays ATP World Tour Finals, which features the world's top eight doubles teams.